When it comes to buying great steak, steak thickness often gets overlooked. Between the best cuts, the best coloring, marbling levels, and USDA grading, there’s a lot to take into account with any given steak. So, you might be surprised to learn how important thickness can be to your steak, and how thinner, supermarket-style cuts can destroy high quality beef. In this guide to steak thickness, we tell you why thicker usually means better when it comes to great beef, the ideal thickness for top-of-the-line cuts like ribeyes and filets, and give you tips for cooking thin and extra-thick steaks. The best cuts of steak aren’t all created equal, so the thickness of each one can vary. There is nothing more frustrating than throwing a well-colored, well-marbled steak on the grill, then finding out it’s overdone before you’ve built up a good sear. If this frequently happens to you, the thickness of your steak might be to blame. The thinner your steak, the worse your chance of achieving a nice rare to medium center, depending on your preference. The reason for this is pretty simple. When you sear a steak’s surface, some of that heat penetrates into the steak, toward the center. With thin steaks, the heat has to travel less to reach the steak’s center, making thin steaks easy to overcook. Because of this, the bare minimum for recommended steak thickness is 1 inch (some naturally thin cuts, like flank and skirt, are the exception). Supermarkets and discount butchers often sell their steaks at one-inch thickness or less. The thinner their steaks, the more steaks they can sell. So always be careful that you’re not being cheated on steak thickness. While 1 inch is a good starting point, the best steaks, especially when it comes to premium cuts like ribeyes and strips, are around 1.5 inches in thickness. A 1.5 inch thick steak – the size you’ll find from most premium butchers or wholesalers – is where steak excellence really starts to happen. Some steak masters suggest even thicker cuts, such as those that are 1.75 inches or 2 inches thick. But for most, a 1.5 inch steak is the perfect size for at-home grilling, broiling, or pan-searing. With a 1.5-inch-thick steak, the steak’s center is better insulated compared to thinner steaks, allowing you to be much more precise when it comes to doneness. 1.5-inch-thick steaks are also easier to cook than extra-thick cuts (2.5 to 3 inches), which require a little more skill and some specialized techniques to achieve even doneness. Let’s say you’ve already gone ahead and purchased a thinner cut of beef. What can you do to ensure your steak stays as tender and flavorful as possible? 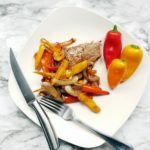 With thin cuts of steak, the best cooking policy is extreme heat for short periods. Your goal should be to sear so quickly and so fast that the heat doesn’t have the time to penetrate much further than the surface. Get your pan or grill up to the hottest it can manage, then sear each side for about 60 seconds. On the other hand, maybe you’ve built up an appetite for a 3-inch-thick, cowboy-cut ribeye. In that case, we advise using a two-temperature method for cooking and using the reverse-sear technique. 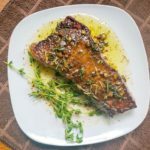 With two-temperature cooking, you cook your steak at one (lower) temperature to bring it up to doneness, then cook it at another (much higher) temperature for searing. While most people sear their steaks first, then bring them up to doneness second, we recommend the opposite order. This is the reverse sear method, and it has two big benefits. First, it makes it easier to measure your steak’s temperature for doneness. Second and more importantly, it means a shorter sear time since the steak is already warm/hot when you start the sear. This means a juicier steak overall and less heat penetration, resulting in a more even center. 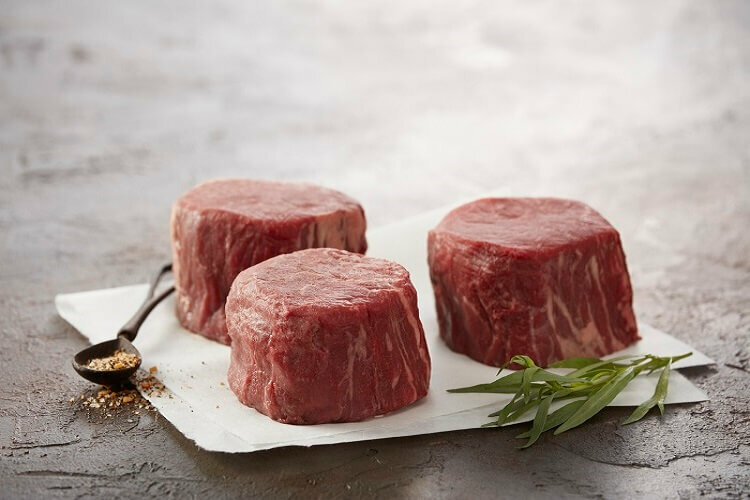 For perfectly sized and juicy steaks, check out our selection of premium filet mignons, ribeyes, porterhouse steaks, and more. In this guide to steak thickness, we tell you why thicker is better when it comes to great beef, and give you tips for cooking thin and extra-thick steaks. The bare minimum for recommended steak thickness is 1 inch (some naturally thin cuts, like flank and skirt, are the exception). With thinner steaks, the heat has to travel less to reach the steak’s center, making thin steaks easier to overcook. While 1 inch is a good starting point, the best steaks, especially when it comes to premium cuts like ribeyes and strips, are around 1.5 inches in thickness. With a 1.5-inch-thick steak, the steak’s center is better insulated compared to thinner steaks, allowing you to be much more precise when it comes to doneness. With thin cuts of steak, the best cooking policy is extreme heat for short periods. Get your pan or grill up to the hottest it can manage, then sear each side for about 60 seconds. For thicker steaks we advise using a two-temperature method for cooking and using the reverse-sear technique. While most people sear their steaks first, then bring them up to doneness second, we recommend the opposite order.